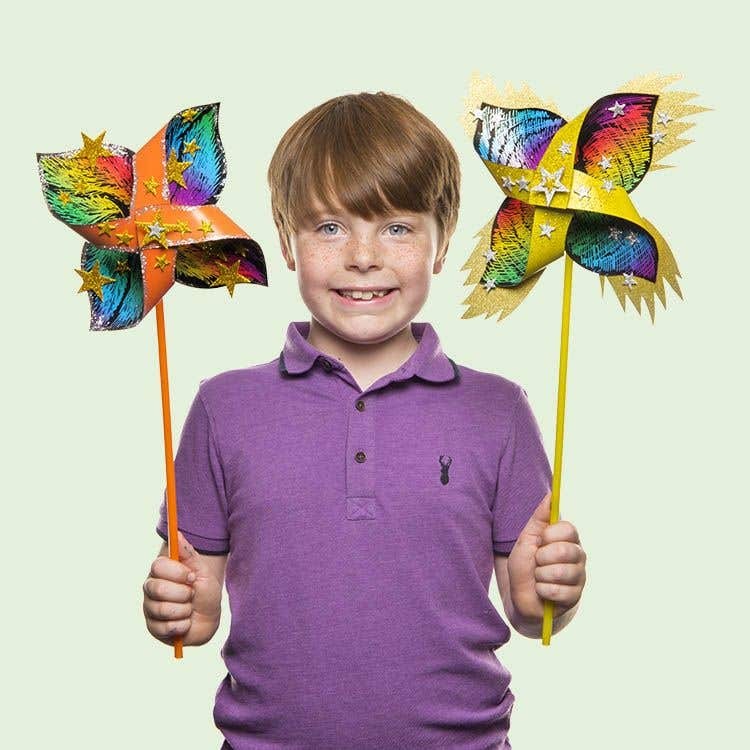 Windmill kits can be adapted into sparkly firework designs. Watch the colours whirl as they spin round! The windmills could also be arranged in a vase or container as table decorations for a party. 45 minutes + drying time for glue. Carefully scratch a rainbow pattern onto the black surface of a windmill shape. Use the tool provided or a wooden craft stick. Follow the instruction to assemble the windmill with the 2 small plastic pieces through the middle. Check the windmill spins freely. If it looks too wide or gets stuck, press small strips of double-sided tape between the strips where they overlap at the front. 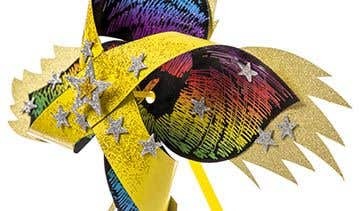 Lightly brush glue around the edge of the windmill or onto the middle strips then sprinkle glitter over the top. To make the windmill shape bigger, cut some zigzag shapes from glittery card. Make them all the same size so the windmill stays balanced. Glue the card shapes onto the back of each section of the windmill and leave to dry. 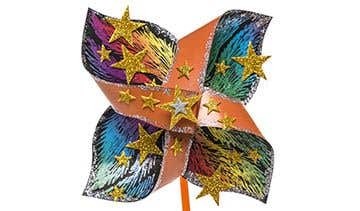 Decorate the windmill with self-adhesive gold and silver stars. 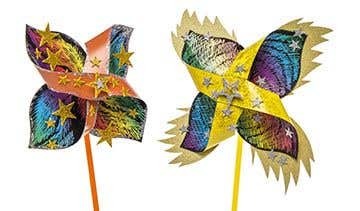 Carefully press a star to in the middle of the windmill to cover the fixing then attach the windmill to the stick. Keep any added card shapes around the edge of the windmill fairly small so they don’t get caught on the stick.